Are you tired of throwing away spoiled produce lurking in the back of the fridge? Did the pot roast you froze eons ago end up with freezer burn? 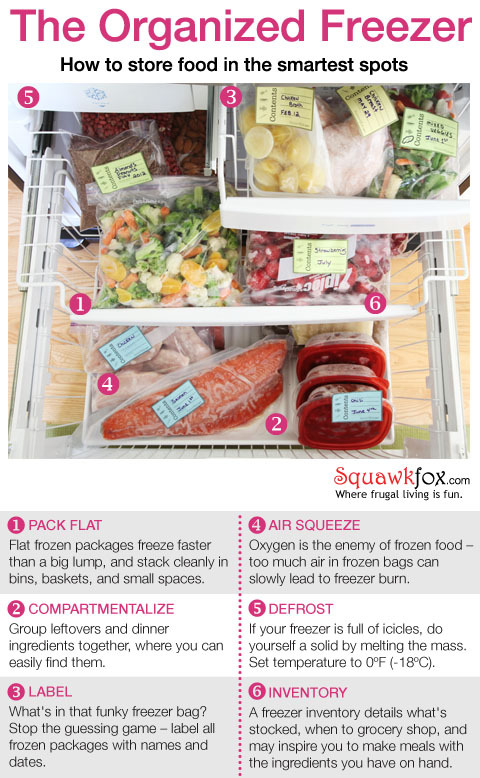 Say goodbye to clutter and food waste by learning how to organize a fridge and freezer properly. A poorly organized refrigerator is a headache in more ways than one. Not only are things hard to find but you risk cross contamination and spoilage when food is not sorted properly. For instance, have you been storing milk on the refrigerator door? That's a big no no. You are better off keeping it on a shelf where the temperature is more stable. How about your freezer? Is it overrun by mystery meats and unrecognizable blocks of food that are frozen solid? All your freezer needs is a little TLC. A great tip is to pack food in storage bags so that they lay flat, creating even more space for other goodies like ice cream. Labeling items that go into your freezer is a must so that you can quickly identify ingredients that can go into a quick meal.